OVERLAND PARK, KS--(Marketwired - August 23, 2016) - Keen Wealth Advisors held a summer educational event for clients and special guests at the Olathe Convention Center on July 14th. Washington insider, Greg Valliere, was the keynote speaker. Valliere discussed the presidential election and how political changes could affect the financial landscape. 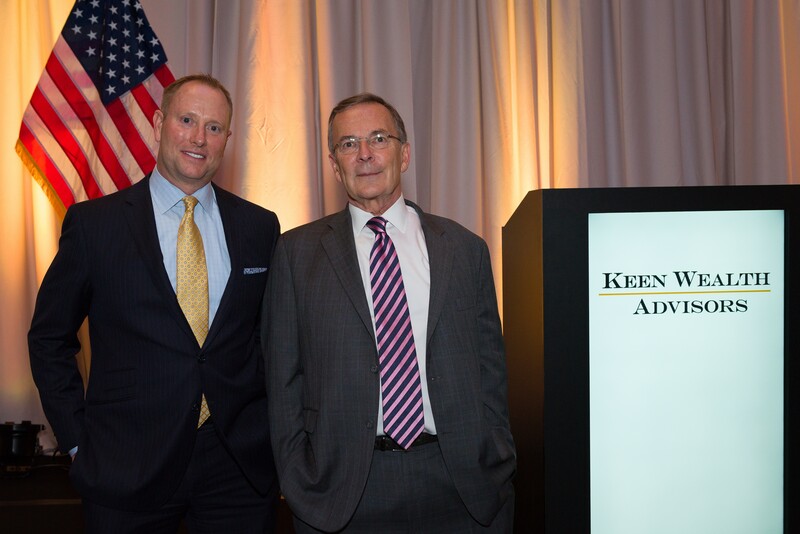 "Greg Valliere did a fabulous job helping our guests better understand how the political chess game and global events can affect the U.S. economy," said Bill Keen, founder of Keen Wealth Advisors. "Going back just a few months, you'd be hard pressed to find anybody who thought Donald Trump would be the Republican nominee and Bernie Sanders would have made such a strong showing against Hillary Clinton in the primaries. But if there's anything we've learned this political season, it's that we should expect the unexpected," added Keen. 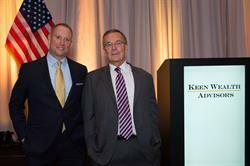 Keen Wealth Advisors takes pride in bringing interesting speakers and topics to their clients. Bill Keen and his staff encourage thoughtful dialog during and after the firm's special events. "We know many of you are concerned about the presidential election and other world events," said Matt Wilson, CFP®, Managing Director at Keen Wealth Advisors. "That's one of the reasons we asked Greg Valliere to join us here tonight -- to help us make sense of current events and, ultimately, to refine our thinking on how each of us can better navigate through the financial decision-making process. Keen Wealth Advisors is pleased to be a professional thought partner and trusted advisor on your journey," Wilson said. This has been one of the ugliest -- and most juvenile -- general elections in recent history. We have a lot at stake as a nation. We need leadership and adult conversations. Unfortunately, the polarization is unlikely to end anytime soon. The campaign finance system is totally corrupt. Good people are stuck in a faulty system. Additional conversation is needed on entitlements. In the next ten years, net-borrowing costs will exceed all domestic spending. Strategic growth will make the deficit more manageable. Stronger growth cures a lot of ills -- it is much better than cutting spending or raising taxes. Repatriation is another cure for some of our problems in the U.S. Tax reform is key to bringing that money home. Janet Yellen is the most powerful person in Washington right now -- she is determined to keep Fed monetary policy accommodative. The economic fundamentals are quite good. Looking out over the next few years, Valliere is bullish. We are starting to see wages pick up, which is going to drive the economy quite nicely. The good news for the U.S. is that the markets got over the BREXIT news pretty quickly. There will probably be more EU disruptions in the future, but those will likely be mitigated through cooperation. A weekly podcast and series of educational articles focused on Retirement is available, free of charge, at www.KeenOnRetirement.com. A podcast featuring Greg Valliere's presentation was released on July 28th. Keen Wealth Advisors is headquartered in Overland Park, Kan. Keen Wealth focuses on helping clients plan for the many different issues that must be considered when planning for the transition to retirement and beyond. Along with his team, firm founder Bill Keen presents on retirement planning and investing topics to the employees of many major corporations. Keen Wealth Advisors is also active in the community with charities and philanthropy events, particularly events benefitting visually impaired youth and those with childhood cancer. For more information, visit http://www.keenwealthadvisors.com. Greg Valliere is Chief Global Strategist at Horizon Investments. In a career spanning nearly 40 years, Greg Valliere is one of the country's leading experts in all things Washington. This includes Federal Reserve policy, tax and spending issues, and -- of course -- politics. He has appeared on CNBC, Bloomberg TV and radio, Fox Business, CNN and CBS radio. Valliere is also regularly quoted in the nation's financial press, including Barron's and The Wall Street Journal.